Average Height	: 28" - 34"
Average Weight	: 100 - 200 lbs. Drawings of dogs who look like Great Danes have been found on Egyptian artifacts dating back to 3000 B.C. and in Babylonian temples that were built around 2000 B.C. There's evidence that similar dogs originated in Tibet, with written reports of such dogs appearing in Chinese literature in 1121 B.C. The breed is thought to have been taken into various parts of the world by the Assyrians, who traded their dogs to the Greeks and Romans. The Greeks and Romans then bred these dogs with other breeds. Ancestors of the English Mastiff were probably involved in the breed development, and some folks believe that the Irish Wolfhound or Irish Greyhound also may have played a role. Great Danes originally were called Boar Hounds, because boars were what they were bred to hunt. Their ears were cropped to prevent boar tusks from tearing them. In the 16th century, the name of the breed was changed to "English Dogges." Late in the 1600s, however, many German nobles began keeping the largest and most handsome of their dogs in their homes, calling them Kammerhunde (Chamber Dogs). These dogs were pampered and wore gilded collars lined with velvet. Talk about a sweet life. The name Great Dane arose in the 1700s, when a French naturalist traveled to Denmark and saw a version of the Boar Hound who was slimmer and more like a Greyhound in appearance. He called this dog Grand Danois, which eventually became Great Danish Dog, with the more massive examples of the breed called Danish Mastiffs. The name stuck, even though Denmark did not develop the breed. Most breed historians give credit to German breeders for refining the breed to be the well-balanced, elegant dog we love today. In 1880, breeders and judges held a meeting in Berlin and agreed that since the dogs they were breeding were distinctly different from the English Mastiff, they would give it its own name. •	Gentle ~ generally get along well with other dogs, animals, and humans. •	Their power bark will scare the wits out of a burglar. •	They don't eat as much food as you'd think. •	Doesn't need a huge yard, and regular exercise. •	Takes up a lot of floor and bed space, you've been warned! •	Takes up a huge space in your heart too! The Great Dane has few grooming requirements although they do benefit from regular, routine grooming. All that is required is a bristle brush or a rubberized grooming mitt that can simple be stroked along the soft, short coat. To keep the coat looking as glossy as possible consider following up grooming with a rub down with a chamois cloth to bring out the natural luster. The Great Dane is a moderate shedder but is not prone to the seasonal heavy shedding of some breeds. Grooming on a regular basis and using dry powder shampoo is recommended as opposed to a full bath. Fully bathing a Great Dane is both difficult as well as potentially damaging to the coat, especially if the shampoo is not completely rinsed out of the coat. If you are fully bathing consider using a professional groomer that has equipment that is specially designed for large and giant breeds of dogs. It is very important to carefully care for the nails of the Great Dane. Keep nails short and level with the ground so they do not push up or into the foot as the dog moves. Use a guillotine type nail clipper specially designed for large breeds. In dark nailed dogs such as the Great Dane it is important to be very careful to not cut into the quick or never and blood center of the nail. This is the same as the cuticle in a human nail, and will bleed profusely as well as hurt the dog if it is cut. In addition there is always a chance of infection with any open injuries on the feet. The Great Dane is a normally inactive dog indoors but will self-exercise if left outside. They do best with regular, structured exercise and once mature and over one year of age they can make excellent jogging companions. Prior to maturity it is very important to limit the amount of exercise, especially running or any strenuous types of exercise to prevent joint and muscle development problems as the breed matures. The Great Dane loves to be with people and will happily go for runs and romps in the backyard with the kids. Without proper exercise the Great Dane will become rambunctious and somewhat independent, often choosing to ignore the owner's commands. The Great Dane does prefer several hours a day outside in moderate temperatures and climates but is very intolerant of long periods in cold or damp conditions. The Great Dane is not prone to weight gain if given enough exercise and fed the correct balance of food. Any signs of weight gain should be immediately monitored and additional exercise time provided as well as careful monitoring of food intake. Exercise such as long walks, hiking or long off leash times are better for the breed than sort, intense periods of exercise. The Great Dane is a gentle and calm dog that is typically very easy to train when training is started when they are very young. 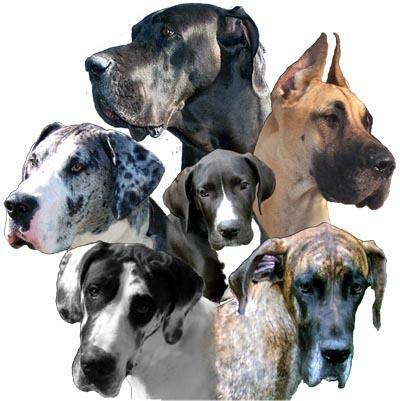 Older Great Danes may be more challenging to work with if they have not had foundation training when they are young. This is very typical of all dog breeds, but the large size of the Great Dane makes it very important to get the foundation training. Obedience training is highly recommended for this breed to incorporate both training and socialization at a young age. The Great Dane should be trained using only calm and positive training methods never aggressive or harsh punishment should ever be used. The Great Dane is a very sensitive breed and will quickly become attuned to the handlers and owners emotions and approval or disproval. Usually a sharp "no" and a lack of attention is all that is required to let the Great Dane know that they have done something wrong. The Great Dane should be leash or lead trained and should be kept in a fenced yard or on a leash when outside. Even though they are not aggressive they are intimidating and can really frighten people that are not familiar with the breed. The Great Dane needs to be socialized with other dogs and non-canine pets and this should be part of the regular training program. The Great Dane is usually relatively easy to train but occasionally a Great Dane can become somewhat dominant, requiring a firm and consistent owner. In these cases a professional trainer can also be used to help the dog and owner learn to work together and prevent dominance issues from becoming a problem. Since the Great Dane is so large it is critical to deal with behavior issues as soon as they occur, never allow bad habits to become established. Often very excited and happy to see owners come home after a long day, they have to be taught not to jump up. Teaching the Great Dane to sit when he or she approaches someone is a great idea and helps to prevent anyone from being nervous when first meeting the dog.